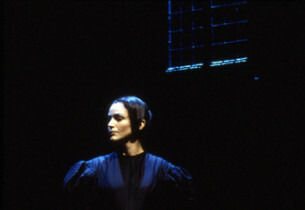 Jane Eyre: Maria Schaffel Mr. Brocklehurst: Don Richard Miss Scatcherd: Marguerite MacIntyre Mrs. Reed: Gina Ferrall Helen Burns: Jayne Paterson Young Jane: Bonnie Gleicher* Mrs. Fairfax: Mary Stout Robert: Bruce Dow Adele: Andrea Bowen Edward Rochester: James Barbour Blanche Ingram: Elizabeth DeGrazia The Figure: Marguerite MacIntyre The Gypsy: Marje Bubrosa Jane’s Memory: Gina Lamparella St. John Rivers: Stephen Buntrock Richard Mason: Bill Nolte Bertha Mason: Marguerite MacIntyre Grace Poole: Nell Balaban Lady Ingram: Gina Ferrall Mary Ingram: Jayne Paterson Young Lord Ingram: Lee Zarrett Mr. Eshton: Stephen Buntrock Amy Eshton: Nell Balaban Louisa Eshton: Gina Lamparella Colonel Dent: Don Richard Mrs. Dent: Marguerite MacIntyre Vicar: Don Richard Young John Reed: Lee Zarrett Schoolgirls: Andrea Bowen, Bonnie Gleicher, Rita Glynn & Female Ensemble Ensemble: Nell Balaban, Stephen Buntrock, Bruce Dow, Gina Ferrall, Gina Lamparella, Marguerite MacIntyre, Bill Nolte Jayne Paterson, Don Richard, Mary Stout, Lee Zarrett Swings: Sandy Binion, Bradley Dean, Erica Schroeder *For this recording only. 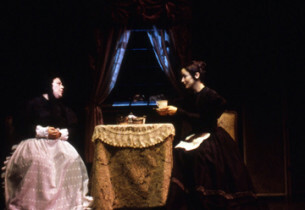 The part of Young Jane was played by Lisa Musser in the Original Broadway Cast. 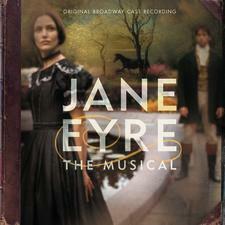 Paul Gordon (music and lyrics) and John Caird (book and additional lyrics) teamed to transpose to the stage Charlotte Brontë’s celebrated novel, Jane Eyre, about the poor orphan girl who becomes a governess at Thornfield Hall, falls in love with her employer, and eventually marries him but only after his wife dies and she herself has inherited a substantial dowry. 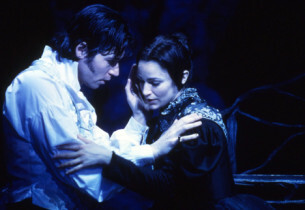 The show, directed by Mr. Caird and Scott Schwartz, though beautifully melodious and catching, failed to find a steady audience and closed after playing 209 performances, following its opening at the Brooks Atkinson Theatre on December 3, 2000.